We have recently spoken to a few new start recruitment companies recently that have taken the approach of waiting to set up their receivables financing arrangements, until they have what they consider to be a sufficient amount of work in the pipeline. This may sound logical, but there are several reasons why it may not serve your best interests as a recruiter. There are a couple of things to consider here. Firstly, there can be time required to set up funding arrangements, despite most funders are able to move pretty quickly. Therefore, it is always going to be best to have your arrangement in place, prior to needing it. You should not take it for granted that a finance company is going to be able to put facility in place instantly, as soon as you have invoices in hand ready to receive prepayments against them. You also expose yourself to the possibility that you are unable to negotiate the best rates when you are in a pressing cash flow situation. The second point to make is that there are selective receivables financing facilities available that have no minimum fees, or turnover levels involved, and so there is no requirement for you to hit a set amount of turnover each month. We have existing arrangements in place with clients that have raised minimal amounts of invoicing in a month, incurring fees as low as just a few pounds. We would strongly suggest that if you starting a new recruitment company, you put your receivables financing arrangement in place as early as possible, giving the funder the maximum time to establish credit limits for your customers etc. In this way, they can ensure that prepayments are not delayed, once you have sales invoices raised to your first customers. Act early. You should also bear in mind that not all financiers require you to have more than a single customer. 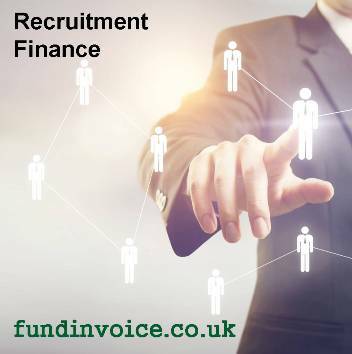 Many of the funders that we deal with are comfortable with an arrangement whereby a recruiter will be dealing with a single debtor initially - this is often the case with a new start labour hire or permanent recruitment company. If you are looking for more sales for your recruitment agency, please get in touch with the full service marketing agency that we work with. They will work with you to develop a plan to expand your customer base. Please contact us if you would like help putting in place funding for your new start recruitment company.